Mechatronics, which is also called mechatronic engineering, is a multidisciplinary branch of engineering that focuses on the engineering of both electrical and mechanical systems, and also includes a combination of robotics, electronics, computer, telecommunications, systems, control, and product engineering. As technology advances over time, various subfields of engineering have succeeded in both adapting and multiplying. The intention of mechatronics is to produce a design solution that unifies each of these various subfields. Originally, the field of mechatronics was intended to be nothing more than a combination of mechanics and electronics, hence the name being a portmanteau of mechanics and electronics; however, as the complexity of technical systems continued to evolve, the definition had been broadened to include more technical areas. The word mechatronics originated in Japanese-English and was created by Tetsuro Mori, an engineer of Yaskawa Electric Corporation. The word mechatronics was registered as trademark by the company in Japan with the registration number of "46-32714" in 1971. However, afterward the company released the right of using the word to public, the word begun being used across the world. Nowadays, the word is translated into many languages and the word is considered as an essential term for industry. French standard NF E 01-010 gives the following definition: "approach aiming at the synergistic integration of mechanics, electronics, control theory, and computer science within product design and manufacturing, in order to improve and/or optimize its functionality". Many people treat mechatronics as a modern buzzword synonymous with robotics and electromechanical engineering. A mechatronics engineer unites the principles of mechanics, electronics, and computing to generate a simpler, more economical and reliable system. The term "mechatronics" was coined by Tetsuro Mori, the senior engineer of the Japanese company Yaskawa in 1969. 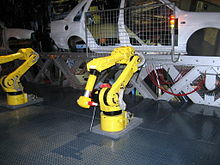 An industrial robot is a prime example of a mechatronics system; it includes aspects of electronics, mechanics, and computing to do its day-to-day jobs. Engineering cybernetics deals with the question of control engineering of mechatronic systems. It is used to control or regulate such a system (see control theory). Through collaboration, the mechatronic modules perform the production goals and inherit flexible and agile manufacturing properties in the production scheme. Modern production equipment consists of mechatronic modules that are integrated according to a control architecture. The most known architectures involve hierarchy, polyarchy, heterarchy, and hybrid. The methods for achieving a technical effect are described by control algorithms, which might or might not utilize formal methods in their design. Hybrid systems important to mechatronics include production systems, synergy drives, planetary exploration rovers, automotive subsystems such as anti-lock braking systems and spin-assist, and everyday equipment such as autofocus cameras, video, hard disks, and CD players. Mechanical modeling calls for modeling and simulating physical complex phenomena in the scope of a multi-scale and multi-physical approach. This implies to implement and to manage modeling and optimization methods and tools, which are integrated in a systemic approach. The specialty is aimed for students in mechanics who want to open their mind to systems engineering, and able to integrate different physics or technologies, as well as students in mechatronics who want to increase their knowledge in optimization and multidisciplinary simulation techniques. The speciality educates students in robust and/or optimized conception methods for structures or many technological systems, and to the main modeling and simulation tools used in R&D. Special courses are also proposed for original applications (multi-materials composites, innovating transducers and actuators, integrated systems, …) to prepare the students to the coming breakthrough in the domains covering the materials and the systems. For some mechatronic systems, the main issue is no longer how to implement a control system, but how to implement actuators. Within the mechatronic field, mainly two technologies are used to produce movement/motion. An emerging variant of this field is biomechatronics, whose purpose is to integrate mechanical parts with a human being, usually in the form of removable gadgets such as an exoskeleton. This is the "real-life" version of cyberware. Another variant that we can consider is Motion control for Advanced Mechatronics, which presently is recognized as a key technology in mechatronics. The robustness of motion control will be represented as a function of stiffness and a basis for practical realization. Target of motion is parameterized by control stiffness which could be variable according to the task reference. However, the system robustness of motion always requires very high stiffness in the controller. Avionics is also considered a variant of mechatronics as it combines several fields such as electronics and telecom with Aerospace engineering. The Internet of things (IoT) is the inter-networking of physical devices, embedded with electronics, software, sensors, actuators, and network connectivity which enable these objects to collect and exchange data. IoT and mechatronics are complementary. Many of the smart components associated with the Internet of Things will be essentially mechatronic. The development of the IoT is forcing mechatronics engineers, designers, practitioners and educators to research the ways in which mechatronic systems and components are perceived, designed and manufactured. This allows them to face up to new issues such as data security, machine ethics and the human-machine interface. ^ Mechanical and Mechatronics Engineering Department. "What is Mechatronics Engineering?". Prospective Student Information. University of Waterloo. Retrieved 30 May 2011. ^ Faculty of Mechatronics, Informatics and Interdisciplinary Studies TUL. "Mechatronics (Bc., Ing., PhD.)". Retrieved 15 April 2011. ^ Lawrence J. Kamm (1996). Understanding Electro-Mechanical Engineering: An Introduction to Mechatronics. John Wiley & Sons. ISBN 978-0-7803-1031-5. ^ ″Motion Control and Advanced Mechatronics″. ^ Bradley, David; Russell, David; Ferguson, Ian (March 2015). "The Internet of Things-The future or the end of mechatronics". Mechatronics. Bradley, Dawson et al., Mechatronics, Electronics in products and processes, Chapman and Hall Verlag, London, 1991. Karnopp, Dean C., Donald L. Margolis, Ronald C. Rosenberg, System Dynamics: Modeling and Simulation of Mechatronic Systems, 4th Edition, Wiley, 2006. ISBN 0-471-70965-4 Bestselling system dynamics book using bond graph approach. James J. Nutaro (2010). Building software for simulation: theory and algorithms, with applications in C++. Wiley. Robert Munnig Schmidt, Georg Schitter, Adrian Rankers and Jan van Eijk, The Design of High Performance Mechatronics – 2nd revised edition. IOS Press, 2014. Bishop, Robert H., Mechatronics: an introduction. CRC Press, 2006. Onwubolu, Godfrey C., Mechatronics: principles and applications. Butterworth-Heinemann, 2005. This page was last edited on 8 March 2019, at 12:47 (UTC).